Do you have a child learning to tie their shoelaces? Easy Tie Laces make learning easy for your little ones. We are giving away a pair of Easy Tie Laces and an Amazon Gift Card! Learn more about the Easy Tie Laces below and then enter to win! When your little one is learning to tie their shoes, it can full of frustration. Luckily, there’s an innovative new product that can remove the two biggest obstacles in shoe tying: lace confusion and floppy laces. Easy Tie Shoelaces help your child learn to tie by replacing their regular laces with special, dual colored laces. Created by a teacher and designed by an engineer, Easy Tie Shoelaces may look ordinary but they are actually the most advanced shoelaces on the market and your child’s best bet when it comes to mastering shoe tying. No more fumbling with two stark white laces, wondering which loop is which. Dual colors aid in lace identification and the design of the lace holds its shape and allows early tiers time to tie. Another great feature is that some of the laces have a special texture. Easy Tie knows that although color is important, texture can be the key to learning and understanding for some children. That’s why, the striped laces (in either Pink & White and Black & Grey) have a courser texture to them. Just pair one of those laces with any of the solid color laces to provide both a unique look and critical sensory feedback. Another cool thing about Easy Tie laces is that they’re designed in a way that guarantees that they will always stay even in length (37 inches and perfect for shoes sizes 8-3). Always even, non-floppy, cool colored laces! Easy Tie Laces are the perfect tool for setting your child up for shoelace tying success. They even come in 9 vibrant colors so your child can pick their favorites! 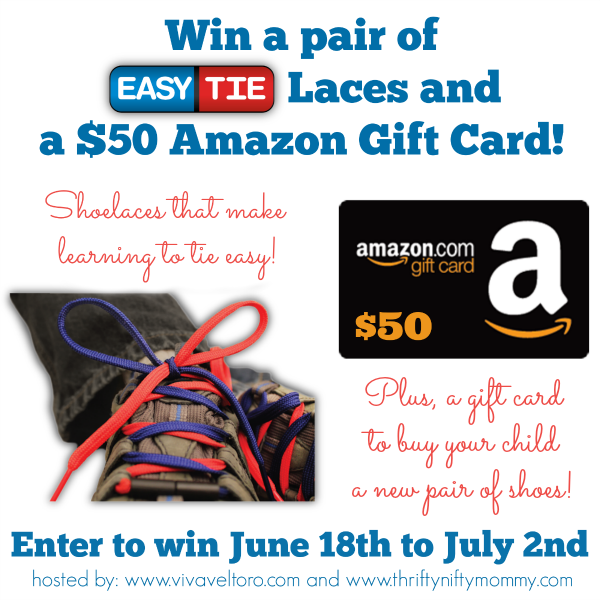 Easy Tie Shoelaces wants to give one lucky person a pair of their innovative laces, PLUS a $50 Amazon Gift Card so you can purchase your child a pair of new shoes! Open to the US only, ages 18 and up. Ends 7/2/14 at 11:59 PM EST. Disclosure: I did not receive any compensation for hosting this giveaway. Viva Veltoro, Thrifty Nifty Mommy and the participating bloggers are not responsible for prize fulfillment. Please contact vivaveltoro(at)gmail.com with questions about this giveaway. « Are You a Cyber Smart Parent? I’d get black and gray, and red. Purple with Black and Grey. I would choose pink and white. Thanks for the chance to win! I would choose the purple and white/pink shoelaces. I would choose pink and white for my girls. Pink and white would be the ones I’d chose. I like the purple + black. I like the pink and red shoelaces. I would choose purple and pink …her favorite colors!